A RIDE CAN EASILY BE ARRANGED! by Jim Corbran, Automotive Columnist This might be one of those new models you don’t necessarily want a ride in. 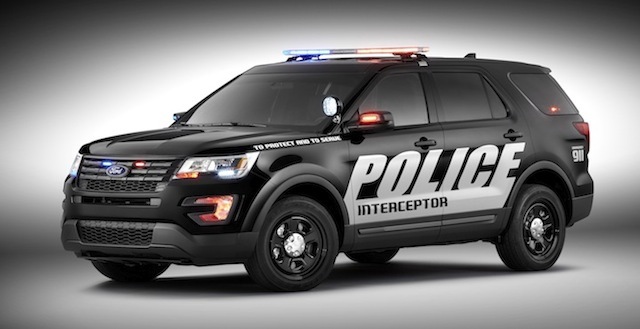 We’re talking of course of the 2016 Ford Police Interceptor Utility (PIU) — better known to us civilians as a souped-up Ford Explorer. If you didn’t already know, Ford will be glad to tell you that the PIU is America’s best-selling police vehicle. It probably doesn’t hurt that it’s designed with input from Ford’s Police Advisory Board, which consists of 25 law enforcement experts who also serve as a pilot group for new products. The new 2016 PIU should be rolling out this summer, and will feature a slightly redesigned front and rear, new headlamps and instrument panel, and an enhanced electrical system. The standard powerplant is a 3.7L V6 engine rated at 304 hp, while a 3.5L EcoBoost V6, rated at 365 hp, is an available option. Its six-speed automatic transmission is capable of switching to Pursuit Mode when it detects aggressive driving situations (a.k.a. — a chase! ), which will change its up- and down-shift points for maximum performance. All vehicles come equipped with all-wheel drive, heavy-duty suspensions, and unique steering and transmission calibrations. And, I think it looks kind of cool. Coming soon to a rearview mirror near you. more info at: http://www.ford.com/newsevents/ ### The post A RIDE CAN EASILY BE ARRANGED! appeared first on Buffalo Cars.